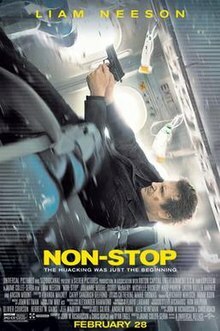 As a fan of Liam Nesson’s hit film ‘Taken’, I was pleased to see him take up the role of an Air Marshall in the new thriller ‘Non Stop’. However, I was slightly concerned about the similarity of the film to that of Taken and thought it wasn’t pushing Neeson as an actor or breaking any new boundaries as an original film. I was pleasantly surprised though. The film has you captured from the opening scene and doesn’t bear any resemblance to Taken (well maybe a little) but not enough to link the two together. Neeson plays Bill Marks, an Air Marshall who has drunk the years away over the death of his daughter. On a flight from London to New York, Marks gets a text saying that if he doesn’t deposit $150 into an account provided, someone will die every 20 minutes. He tries to warn the other Air Marshall, Hammond but he doesn’t believe him and after finding him acting suspicious, ends up killing the Marshall only to find out he isn’t the killer. More passengers begin to drop dead every twenty minutes without a sign of the culprit. Marks befriends the passenger next to him, Jen Summers (Julianne Moore) and works with her and the flight crew to find the killer as the mystery deepens. The film takes a dark twist as it leads us to believe one person is the killer and then relief as it is finally revealed at the end to be someone else. Marks also suspects Jen at one point but this is quickly dismissed. There is drama, action and lots of tension, providing a non stop 106 minutes of pure thrills as only Nesson can deliver. Well worth a watch.